A Quarter Peal of 1260 Plain Bob Triples was rung in 47 minutes, at St Faith's, Havant by the Royal Naval Guild of Bellringers on the 25th May 2012, the 30th anniversary of the sinking of HMS Coventry. This was rung in memory of all the personnel of HM Services, including those of the Royal Fleet Auxiliary and Merchant Navy, who lost their lives in the Falkands War. 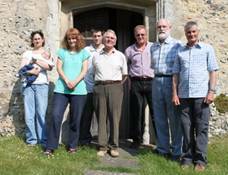 + Not a member of the Guild, but the Quarter Peal counts as there were Seven members ringing. With the Queens’ birthday falling in Holy Week and the Royal Wedding on the 29th, it was decided to arrange the outing for the following day. So, on a glorious Saturday morning we set off for the Amersham area to our first tower, Chalfont St Peter. One member of the band asked to be replaced owing to family commitments, so I engaged the help of Mike and Gemma Hurst who stood in together with baby Daniel for the day. At Chalfont St Peter, We rang a reasonable quarter of Grandsire Doubles, which did have a sticky part in the fifth extent, but was successfully finished. 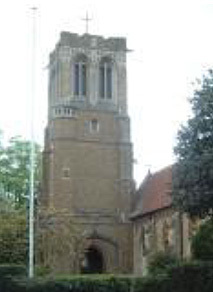 Then, off to Chenies, a tower that Doug recommended as he rang there regularly while based at nearby Northwood. Nice bells and striking that got better and better as we went, saw a very successful and enjoyable quarter of Cambridge (method chosen to suit HRH’s new title) conducted by Mike. Then off we went to a pleasant lunch at the pub in Chenies. For the last tower, we travelled to the other side of Amersham to Little Missenden, a mediaeval church with interesting wall paintings and a mix of old and new bells (the third is c1340. For our last quarter, it being the end of April, Mike called April Day Doubles. Lovely bells and excellent striking made this probably the best and most enjoyable of the day. Reports are on Campanophile and will appear in the Ringing World in due course. 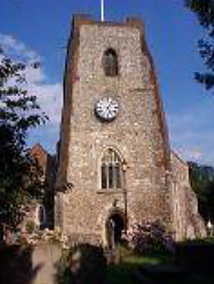 Also rung in memory of David Robbins (1938 to 2011) Ringer at this tower. So, lovely weather, a nice area and good ringing made for another successful RNGB ringing day out, while marking HM’s birthday and the Royal Wedding in the appropriate manner. The area, being close to the M25 and the Metropolis, is surprisingly picturesque and worthy of another visit for sightseeing rather than ringing. Thanks to all who took part and particularly to Mike and Gemma for coming along at short notice, and to Mike for calling two of the quarters. For Trafalgar this year, I have arranged a peal attempt at Holybourne near Farnham in Hampshire, a lovely little 8 which I am looking forward to. This will be on the morning of October 21st prior to departing for the Trafalgar outing. On a glorious Wednesday morning we converged on an area just inside the M25, chosen for ease of travel and access for the band. We had two 8 bell towers in the morning and, with two ringers having to depart after lunch, a 6 bell tower in the afternoon. The first quarter, Grandsire Triples, was rung on the heavy 8 at Walton on Thames and called by James. A recent entry in Doves showed that the seventh was cracked. This however was not apparent as we rang a very respectable quarter in this busy town centre tower. Then 5 minutes away was Oatlands Park, an unusual tower and pleasant light 8, although difficult to hear in the tower. With a strong band, we opted for Yorkshire called by Diana, which went very well. An added point of interest here was that the tower captain Mr Bruce Rogers, now in his eighties, rang in the first peal by RN officers and men. Our records show that O/Sea Rogers rang the seventh to Plain Bob Major on January 14th 1948. After a pleasant lunch at the Olde Swan beside the Thames near Hampton Court, we rang our last quarter, Plain Bob Minor, called by Mark. An enjoyable and successful day was had bay all. Appropriate footnotes appear on Campanophile and will be published in the Ringing World in due course. With the death of Henry Allingham, who served in the Royal Naval Air Service in the First World War and then became a founder member of the RAF, it was decided that the RNGB should mark his passing in some way. The funeral was held on Thursday July 30th at St Nicholas, Brighton, attended by the Duchess of Gloucester and high ranking RN and RAF officers, took the form of a major event with national media coverage. Two members of the RNGB and two from the RAFGB were invited to ring in the half muffled quarter peal of Grandsire Caters, to be rung immediately prior to the funeral. James Ingham and myself took part and the quarter, which was heard on national news, was a good one and at a standard befitting the occasion. 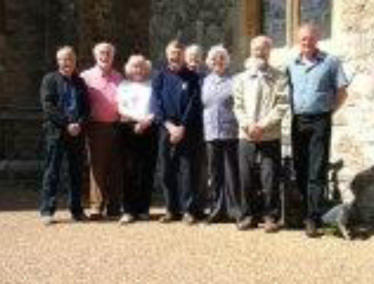 On Saturday August 1st, the Guild had also decided to mark Mr Allingham’s passing with a quarter peal outing. Eight names were immediately forthcoming, so two towers and a pub were booked. Given the reason for ringing and it being the RNGB, the tower contact at Petersfield had notified the press, so we were met after the quarter by the photographers and there should be a feature in the next edition of the Petersfield Post. With it being a town centre church on a busy market day Saturday, Grandsire Triples was the chosen method for best striking and chance of success. A composition by a ringer from Burton on Trent, who was serving in the trenches at the time, was chosen as most appropriate for the occasion. Nice ringing and very few mistakes led to a quarter that did us justice and was given the thumbs up from those listening outside. Over lunch at the Rising Sun, Clanfield, we decided to play it safe(ish) again and ring Plain Bob at Catherington. We had been slotted in between two weddings and arrived in the pouring rain, just as the first lot of guests were leaving. A light 8, the bells lent themselves to ringing major and an equally good quarter was duly rung. Shortly after Henry Allingham died, so too did Harry Patch, the last of the Army WW1 veterans, so the quarter peals were attributed to them both. I’d report that the RNGB gave a good account of itself at both the funeral and the Quarter Peal day and thanks to all who took part. A Quarter Peal of 1260 Doubles was rung at All Saints' Church, Eastchurch, Kent by members of the Royal Naval Guild of Bellringers on Friday 1st May 2009, for the service of thanksgiving for 100 years of naval aviation held at the aviation memorial in Eastchurch, the cradle of naval flying. 1909 saw the first aircraft factory being established near Eastchurch on the Isle of Sheppy and included within the first pupils were four naval officers, who went on to become founder members of the Royal Naval Air Service. The centenary of this event was celebrated on 1st May 2009 by the Royal Navy with a service of thanksgiving at the Pioneer Flying Memorial at Eastchurch and the RNGB were invited to ring for the occasion at All Saints' Church, which is directly opposite the memorial. James Ingham, ex Fleet Air Arm, conducted the Quarter, which was well struck and mistake free, being assessed as 'very satisfactory' by the RN inspecting staff! A Quarter Peal of 1344 Grandsire Triples was rung at St Bartholomew and All Saints Church, Wootton Bassett, by members of the Royal Naval Guild of Bellringers, Army Guild of Bellringers and Royal Air Force Guild of Bellringers on Saturday 15th November 2008, as a compliment to the Wootton Bassett towns people for their support for our repatriated personnel. This Quarter Peal was rung by the members of the three Service’s Guilds to honour the towns people of Wootton Bassett who have unstintingly turned out in all weathers to pay their respects to deceased Service personnel as they are repatriated to Britain. The original idea came from Paul Southward of the Army Guild who couldn’t actually take part in the ringing as he was undergoing pre-mobilisation training before being deployed with the Royal Signals. Pulling together the ringers from three different Guilds was no mean task but made all the easier with the help of respective Guild secretary’s pulling in ringers from as far afield as Warwickshire to just down the road at South Petherton. 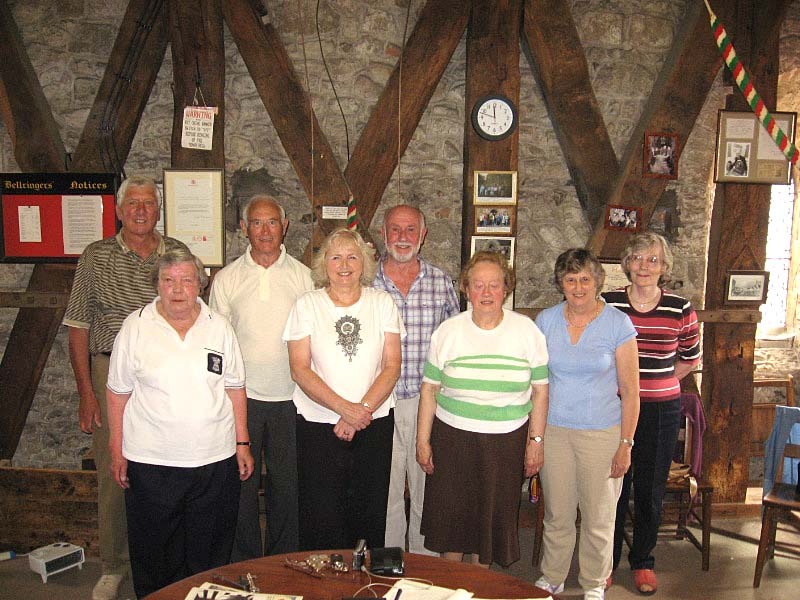 The tower captain of Wootton Bassett, David Whip very kindly arranged the publicity that included an article in the Swindon Advertiser followed up the ITV West film crew who did a superb job in filming and recording the ringing, interviewing the ringers and towns people alike. The hospitality of the Wootton Bassett ringers was fantastic with a complimentary round of drinks in the local hostillery, although the deal was that if we finished early we would buy the drinks, no more incentive was required to make sure we achieved the quarter if there was free drink in it. 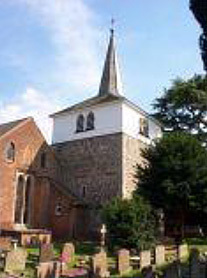 A Quarter Peal of 1260 Plain Bob Triples was rung at St Faith's, Havant by the Royal Naval Guild of Bellringers on the 25th May 2007, the 25th anniversary of the sinking of HMS Coventry, in 48 minutes. "If you were in the town centre around 11am on Friday 25th May you will have heard the bells of St Faith’s being rung for a continuous period of 48 minutes. 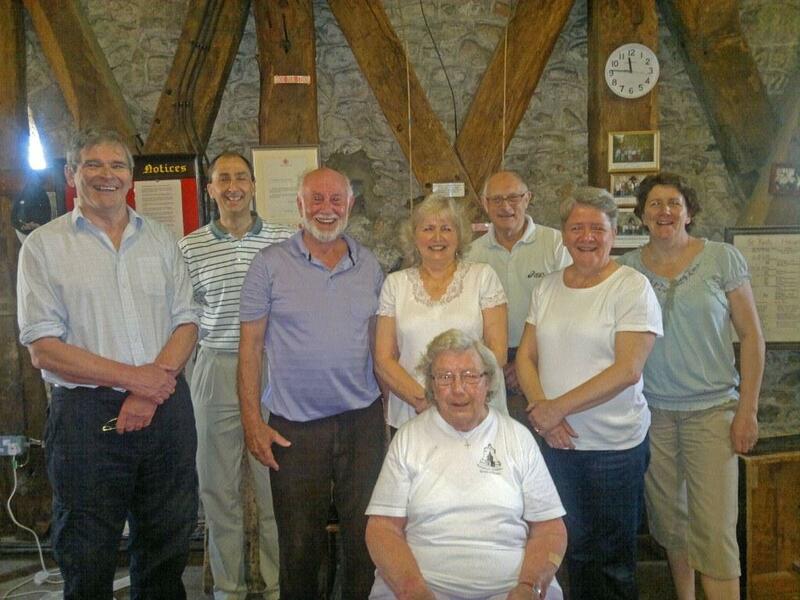 That wasn’t our usual band practising; it was eight skilled ringers from the Royal Naval Guild of Bellringers (including our tower captain Barbara Skilleter) who successfully rang a Quarter Peal of 1,260 Plain Bob Triples. The date was the 25th anniversary of the sinking of HMS Coventry. Our Bill Skilleter was on HMS Broadsword that went to the rescue. The Quarter Peal was rung in memory of all the personnel of HM Services, including those of the Royal Fleet Auxiliary and Merchant Navy, who lost their lives in the Falklands War. The method (or tune) that was rung is called “Plain Bob Triples”, which is a predefined sequence of ringing the 8 bells. The sequence can be varied so that it doesn’t repeat until all possible variations have been rung. A quarter peal is a set of sequence variations on the basic method (tune) that consist of a quarter of all of the 5,040 possible sequence variations. It is only a true quarter peal if no mistakes are made and all of the sequences are different without any sequences being repeated. That is why it is difficult. The 1,260 sequence variations took 48 minutes to complete. Well done the Royal Naval Guild!" 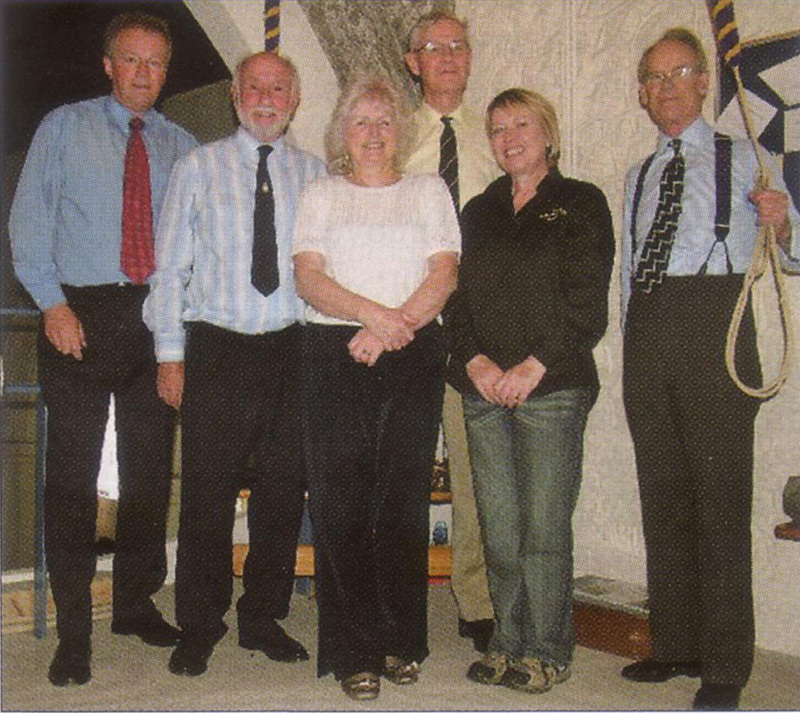 * Not a member of the Guild, but the Quarter Peal counts as there were seven members ringing.